The Citi Mobile Challenge for the EMEA concludes tomorrow with their last stop, Demo Day in London. Attending the Jerusalem event, there were several interesting takeaways of mobile trends in the market. Viewing some of the demos, part of me wondered ‘who needs this’. But, as the rest of my day went by, I found myself wanting a few of those products that didn’t seem so interesting. Case in point was HopOn. 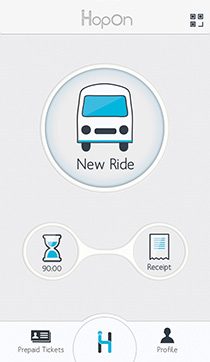 The firm has created a mobile app to buy tickets for public transportation. On first glance I wondered how much added value this app provides for me compared to the existing multi-company transportation card in my pocket which lets me easily ride buses and trains in Israel. But, leaving the event found myself in a city where I usually don’t rely on public transportation, and being required to find an ATM to purchase a one-way ticket. Suddenly, the idea of HopOn and purchasing a ticket for that bus ride on my phone didn’t sound so bad. Viewing some of the demos, part of me wondered ‘who needs this’? I initially had the same initial thoughts when viewing the demo for Paybox and their group payment app as well as the mobile gift sending social service from Oh Wa. However, I later appreciated he potential use cases. Overall, like many mobile apps, financial related products are solving problems that we don’t realize we had. But, once we have that ‘Uh Hah’ moment of getting it, it makes us wonder why we didn’t think of that first. One area that seems ready to blow up with lots of firms entering is incentive based mobile advertising. In general, mobile advertising is a problem for many firms since they struggle to monetize traffic from phones and tablets. One solution is to draw users towards apps, which have less friction among mobile users than filling out forms and entering payment information. However, apps aren’t the business model being used by every firm that has meaningful mobile traffic. Providing a new alternative, and taking advantage of data mining and GEO location technology on mobile devices is a new breed of location based advertising products. Connecting with banks and credit cards, these products such as those demoed by Banch and BzBuzz provide notifications to users in real time when they are near participating merchants. The startups at the Citi Mobile Challenge are far from the only companies engaged in creating such products, with similar firms across the globe scrambling to market such mobile advertising products to banks and credit cards. Among them, an interesting entrant from Uruguay is Moneero, which is having success by partnering directly with merchants and restaurants, and allowing them to notify customers of specials and create their own rewards programs. As discussed when first reviewing the event this week. Another area that is seeing innovation is mobile based identity verification. Startups that demoed in Jerusalem were IDMission and OneVisage and are joined by other players such as Jumio, and even the global giant American Express in their goal of creating mobile identity products. The future of these products could lead to banks and other financial institution customers being able to open accounts and get verified through a ‘selfie’ directly from their phones. Facial verification could also be integrated within payment apps and used to verify transactions. Similar to mobile verification apps that can streamline the onboarding process for new accounts, other apps are coming to market with time saving potential. Explaining his rationale in investing in Uber, noted entrepreneur, Gary Vaynerchuk explained that Uber is essentially a time saving app, with people willing to pay a premium to save time. In this regard, there is potential for app developers that are creating products for banks and brokers to find an interested audience by focusing on the time saving capabilities of their products. Among demoed products was Finovest which had created a system for advisors to send clients trading advice through SMS notifications. The product allowed firms to customize who is being sent a message with the aim of increasing client/broker engagement and saving their time by enabling mass customer notifications at once. Probably the most ironic aspect of a mobile technology event sponsored by Citigroup is that most of the products can’t even be used by their staff. Among the many Citi staff at the event, a number were spotted pulling out their Blackberries. While a common view five years ago, it is a safe assumption that when anyone takes out a Blackberry phone in 2015 they work for a financial institution. This hold trues for Citigroup of which the majority of their staff with company smartphones are limited to using Blackberries. Whether this is a security issue or due to using legacy messaging technology internally, there is no lack of global bank employees carrying around two phones; one for work emails and the other a more useful iOS or Android device.